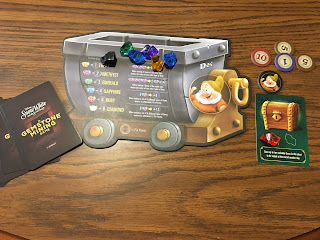 The Five(ish) Fangirls Podcast: Chrissy's Review of "Snow White and the Seven Dwarfs: A Gemstone Mining Game"
Chrissy's Review of "Snow White and the Seven Dwarfs: A Gemstone Mining Game"
Note: We had a nice, lovely podcast all recorded and ready to go at our usual time. Except the audio gremlins got into the recording, corrupted the file, and rendered it unusable. The rest of the Five(ish) Fangirls were able to gather and re-record our latest episode, but I (Chrissy) was unable to join them. Since I reviewed this game on the original recording and that review is now lost, I'm going to review it on our blog instead. There was some serendipity in when this game arrived on my doorstep - I received it this past weekend just in time for Sunday dinner with my in-laws and one thing about my in-laws is that they all LOVE to play games. So this was perfect timing for us to try out this new game. 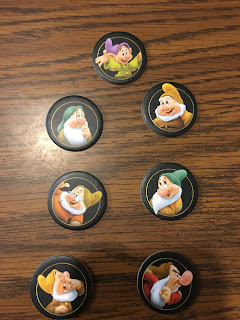 This is a game based on Disney's Snow White and the Seven Dwarfs (obviously) and it is based on another game called Quartz. Not having ever played Quartz, I couldn't tell you if this version holds true to the original, I'm just going by what was written on the box. 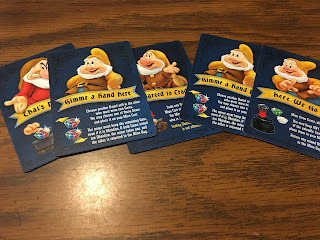 In this game, you play as one of the seven dwarfs (well... six in my case... we'll get to that). 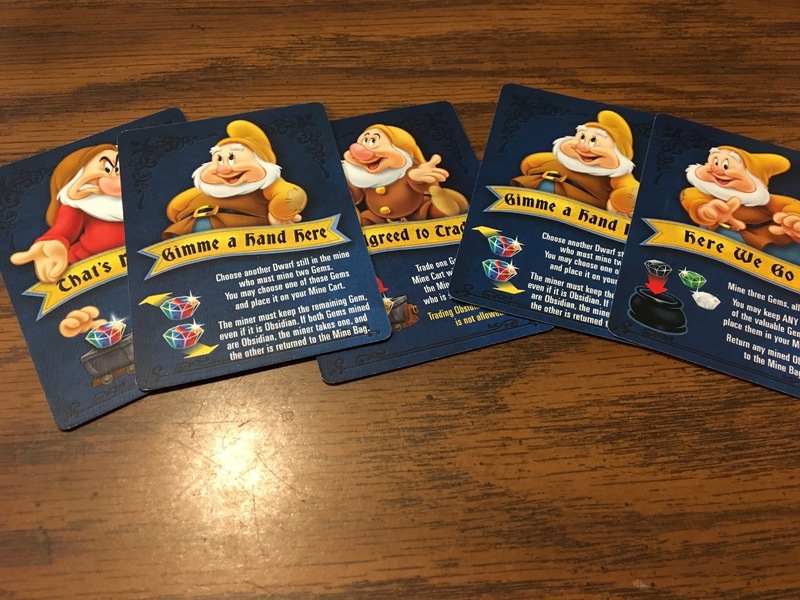 The object of the game is to mine gems and exchange them at the end of the day for Snow White's delicious pies. Depending on the kind of gems you mine, the combinations you get, and whether or not you are forced out of the mine due to an accident, you could end up with a nice hefty pile of pies. The game mechanics are fairly simple, which I would expect from a game meant to be geared toward kids. That's not to say that it's overly simplistic, because we played it with all adults on Sunday night and everyone seemed to enjoy the game. 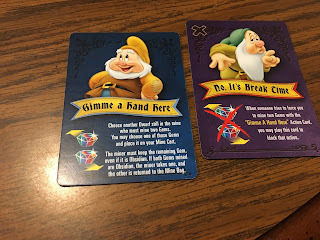 You have three things you can choose to do in each turn: mine a gem (draw a gem out of the bag), play a card, or leave the mine. In later turns, you may want to leave the mine because if you end up with two obsidian gems (the dull black gems), you have an accident, you're forced out of the mine, and you lose all your gems for the day. Playing cards will often help you mine more gems than if you just drew gems one by one. But, again, you have to watch out for those obsidian gems. Now, you can voluntarily leave the mine (ie, leave the round) and keep the gems you already have. This is nice if you already have one obsidian gem and don't want to risk drawing a second one. You also can get Bravery Points for leaving on your own... but it's little unclear how those work exactly. What we had the most fun with (and this speaks to how cutthroat my in-laws can be when it comes to tabletop gaming) were the reaction cards. These cards can be played to counteract a regular card that someone else is playing. For example, you could try to take away a valuable gem from someone else with a "That's Not Mine" card, only to have that countered with "Unacceptable!" And I had to laugh at the artwork for the "Unacceptable!" 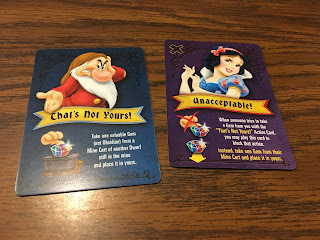 card - it's Snow White looking sweet and princess-y, but I imagine her yelling "Unacceptable!" in her soft and innocent Snow White voice. Now, you can play the game without the reaction cards. 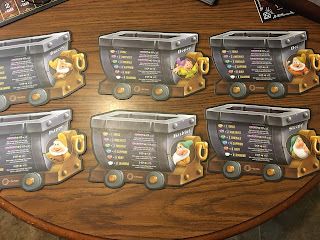 They have a purple background, so you can easily take them out of the deck before you start playing. I can see why the game would allow you that option, especially if you have young kids playing the game and you don't want to have a ton of drama if one kid counters another kid and it devolves into a meltdown. While we all enjoyed the game immensely, there were a few criticisms I had. First off is that the instructions were a little unclear in some areas, particularly relating to when you can draw new cards and how many. True, you can certainly make a house rule that you start each new round/day with a full hand of five cards. But something that simple could easily be included in the official rules. The mechanics behind the Bravery Points and Experience Tokens were a little confusing too. Though that might be solved with looking over the instructions a bit more and playing through the game again. Which I do plan to do. Also - and this could just be a trick of having a review copy, so I'm not going to be overly critical of this - I ended up with only six mine cart boards when the game instructions say I'm supposed to have seven. 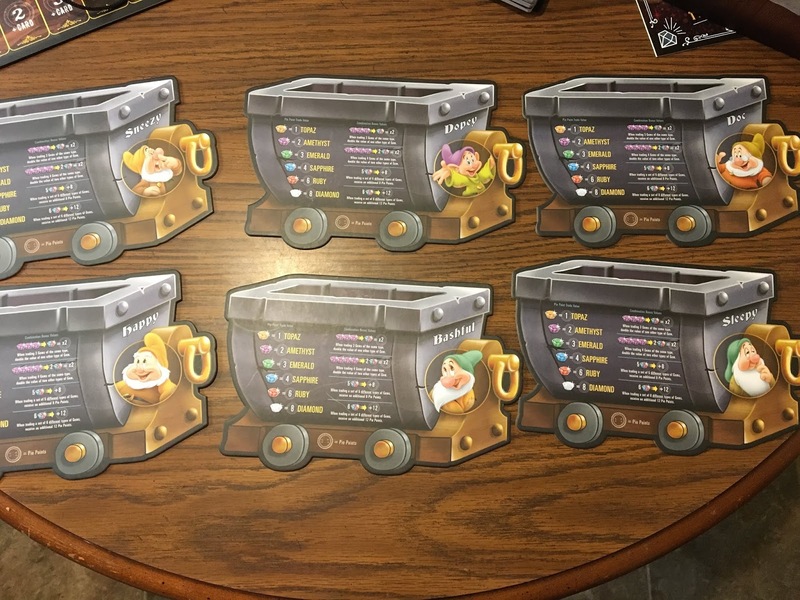 Each mine cart "belongs" to one of the seven dwarfs. Poor Grumpy was without his mine cart. 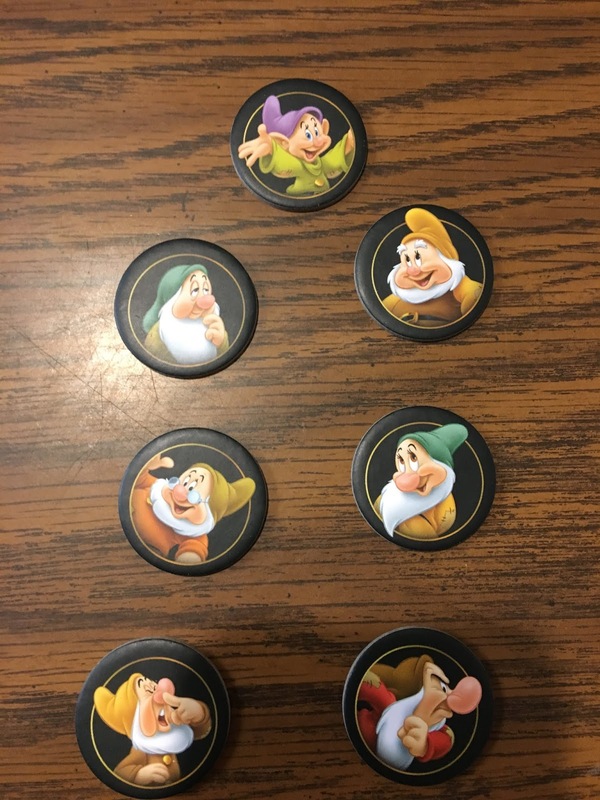 Though I did have the all the corresponding dwarf tokens. So I just chalk it up to an honest mistake. It was more funny than inconvenient. And if I really needed to, I could play without one. Speaking of the materials - the quality and care put into this game is top-notch. The artwork is great (being a Disney licensed product, I would expect nothing less). The pieces look and feel fantastic. For the gems just being colored plastic, they look really nice. The two diamonds actually have a shiny prismatic sheen that makes them feel special. And, being the rarest and most valuable gems in the game, that is fitting. 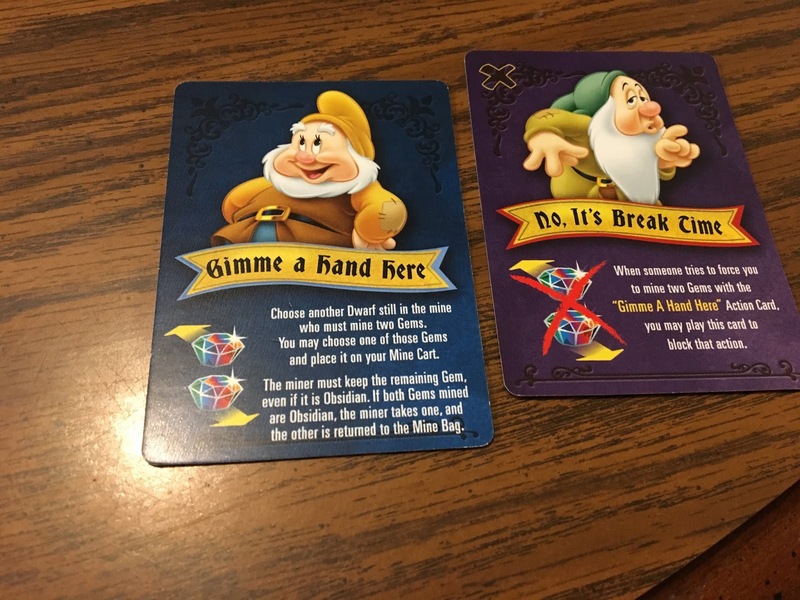 With the Disney branding and characters, I'm certain this game is going to be marketed heavily toward kids. 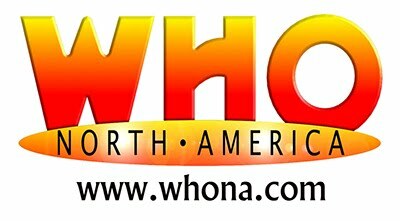 But even if you don't have kids in your life, it is still a fun and entertaining game for adults. This would be a great choice for a family game night or a "bunch-of-friends-gathered-together" game night. It's definitely one that we're going to work into our rotation of family games when we all get together. Bonus points: My mother-in-law also mentioned that this would be a good game to have in her second grade classroom, since the game involves math. So, you all got the teacher stamp of approval! 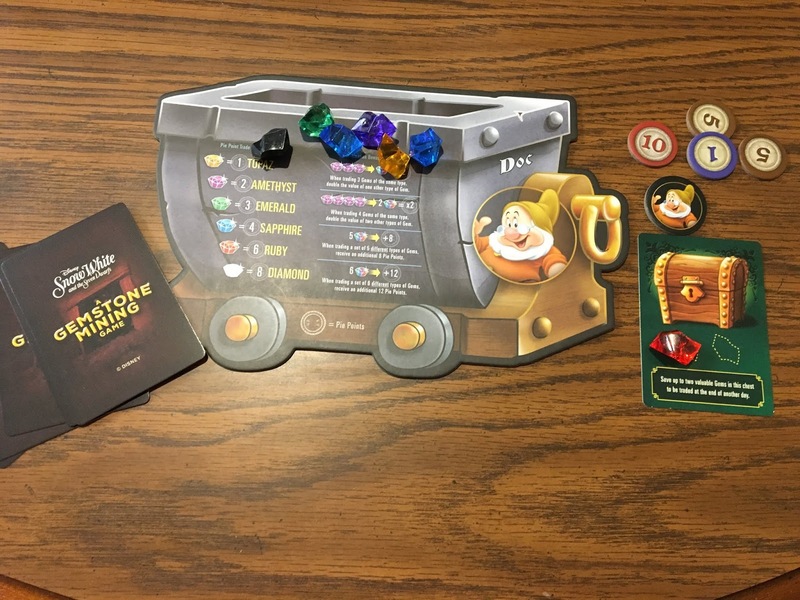 A BIG thank you to our friends at USAopoly for providing a review copy of this game!